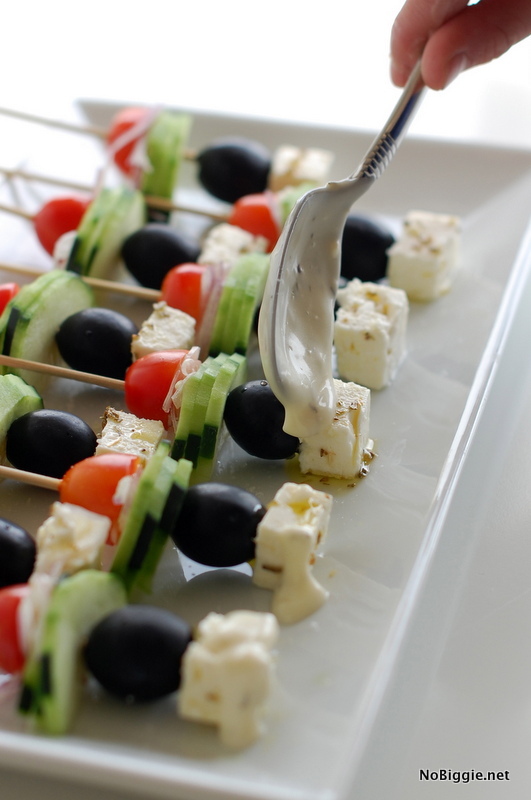 Greek Salad on a stick is a fun way to serve up a favorite salad. I love the cuteness of salad on a stick, so today I’m adding one more to the list. First there was the caesar salad on a stick and then the beet salad on a stick and today it’s a greek salad on a stick. Aren’t they so cute all lined up like this?! To start, I used my ceramic mandolin for slicing and dicing the onions and cucumbers. I love how uniform and thin the mandolin can make vegetables. Once everything is prepped and ready to go, set up an assembly line to make the work go quick. 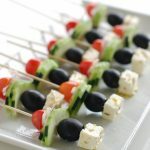 I made about 40 of these little greek salad bites, and the assembly line was awesome. You’ll want the shorter wooden skewers for these. 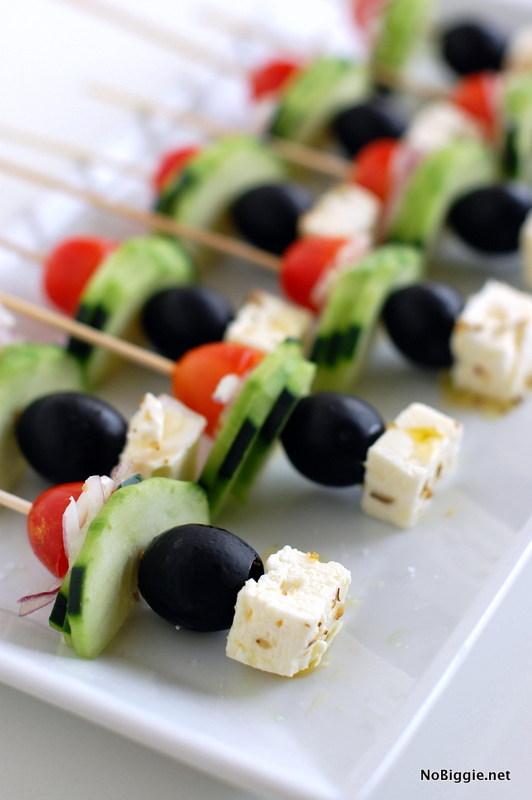 Serve your favorite Greek Salad as a fun appetizer on a stick! We love this easy appetizer. Set up an assembly line of all the prepared ingredients. 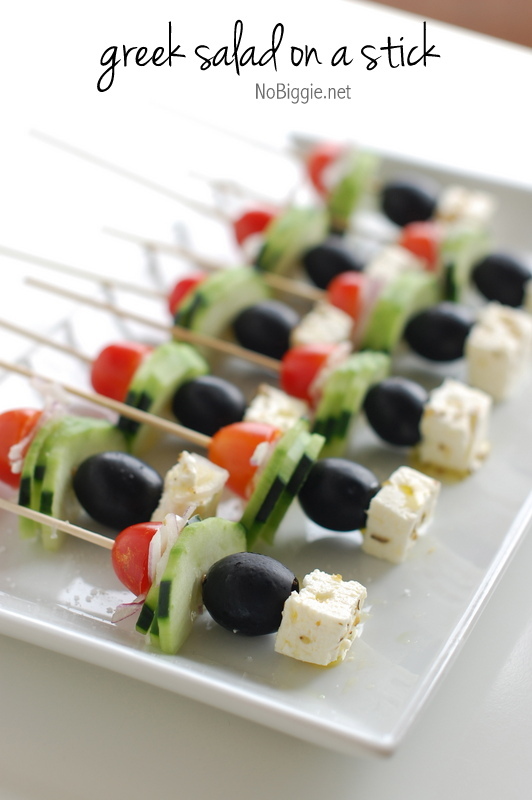 Start to skewer them in this order: 1/2 tomato, cucumber slices, olive and feta cube. 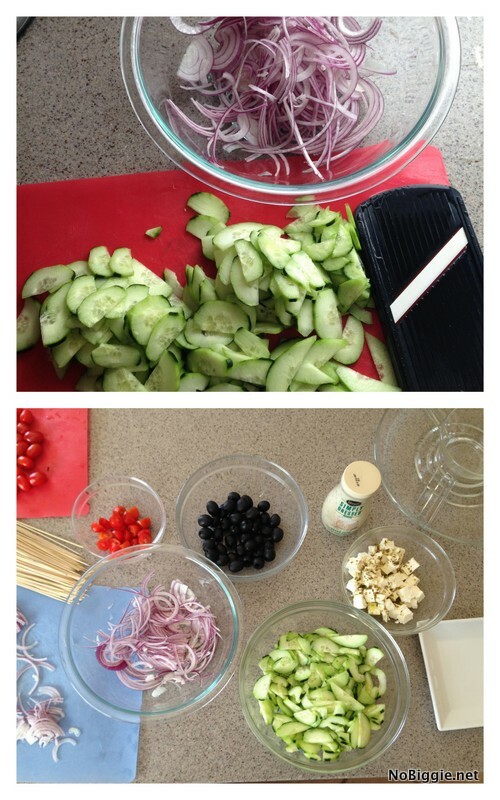 Squish a little red onion in between the tomato and the cucumber slices. *Optional: serve with a little greek salad dressing on the side for dipping. *It is hard to skewer the red onion, so just squish the onion slices between the cucumber and the tomato ...I am not a fan of raw onion at all, but I can handle it when it's sliced so thin like this. *We used black olives, but you can use greek olives here as well. *Add a little dried oregano and olive oil to the feta cubes to keep them from drying out. I love how colorful they are! You can even keep extra dressing on hand in case anyone wants more. I served them over the weekend and everyone loved them, kids included. You’ll have to make them soon! I’d love to know, do you have a favorite salad? *Disclosure: I’ve partnered with Marzetti® using their Simply Dressed® line of refrigerated salad dressing for this recipe. 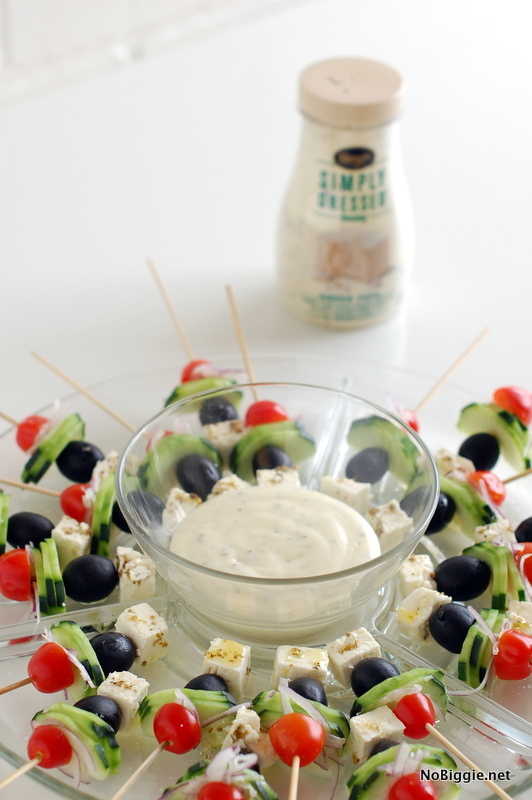 I love their Greek Feta Salad Dressing for these little greek salad bites. This post is sponsored by Marzetti and product has been provided by them. The opinions and ideas expressed here are my own. Thank you for helping support the brands that keep me inspired in the kitchen. How far in advance did you make them? Would they still work if I made them the night before and then dressed them before serving? Yes! Just keep them in the fridge with plastic wrap.